Beyond the "light at the end of the tunnel". About Is There Life After Death? Everybody has wondered what lies beyond this life, but few have investigated this with as much sensitivity and rigor as Elisabeth Kübler-Ross. This first-ever recording of Dr. Kübler-Ross on audio — the pioneer who defined the five steps of grief — tells us what she discovered about the age-old question: Is There Life After Death? 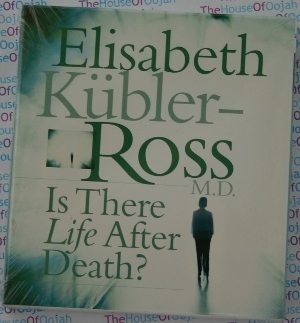 Dr. Kübler-Ross spent decades with thousands of dying patients, observing and inquiring with an open mind and a researcher’s precision, uncovering many astonishing insights into what all human beings experience when we die. Though she kept much of this stunning research private during her life, you now have a chance to hear her speak directly about it. The question of life after death has been pondered in world religions throughout the ages — but now, this compassionate scientist sheds a new light on the eternal mystery of the soul’s passage beyond this physical existence. Is There Life After Death? is an unprecedented opportunity to hear of one of the most renowned healers of our time, as she speaks to us about the wonder, joy, and hope of the journey that awaits us all. Dr. Elisabeth Kübler-Ross, the Swiss-born psychiatrist and author who gained international fame for her landmark work on death and dying, died in her suburban Phoenix home on August 24, 2004. She was 78. Read the news articles about her passing and the Tribute to her by PMH Atwater. In 1999, Time magazine named Elisabeth Kϋbler-Ross as one of the "100 Most Important Thinkers" of the past century. I might add that she is also the "First Pioneer of the Final Frontier Called Death." Elisabeth Kϋbler-Ross was recognized as one of the leading authorities in the field of death, dying and transition. It can be said that she was the one responsible for creating this field of study. She was the author of several books including: On Death and Dying and Life Lessons. Another book of hers, On Life After Death, collected for the first time information drawn from her years of working with the dying and learning from them what life is all about, in-depth research on life after death, and her own feelings and opinions about this fascinating and controversial subject. The following is an excerpt from her book in which she described one of the most interesting near-death experiences she has encountered.